This has been a year of extreme weather—a summer of severe drought, then the wettest November on record, and now the second warmest December on record. On a farm, weather is always simultaneously helping or hurting something. The severe drought this summer wasn’t very good for growing field crops, but vegetable producers (who nearly all irrigate) did alright. Lack of rain means less disease pressure for them. The oddly warm weather we’re having this Christmas means some strange things are happening here on our little farm. First, we have some strawberry plants that are already blooming. They aren’t supposed to bloom till early spring. It’s almost January, and the apple trees are still clinging to their leaves. The oats and crimson clover are almost a foot high. I tried to take a photo of the bees entering their hive, but they all turned out blurry. This time of year, bees would typically be huddled inside the hive to stay warm and conserve energy. No need to do that this year. Some were actually bringing in orange pollen. We’ve owned our little 20-acre farm for about two years now. One of the first items on our to-do list after we purchased the farm from Natalie’s grandparents was to plant some trees—apple trees. We had a good spot for a potential orchard, an unused quarter-acre patch of land that was grown up in brambles and wild Bradford pears. Wild Bradford pears are vengeful creatures, with spiny thorns capable of puncturing a tractor tire. In the spring of 2014, we carefully cleared the pear trees, burnt off the weeds and brambles, and then plowed the patch. After that, we planted a summer cover crop of buckwheat (which the bees loved) and a fall cover crop of crimson clover. We also planted the apple trees in the fall, in November 2014. We planted 12 Winesap, 12 Arkansas Black, 7 Grimes Golden, and 1 Lowry. These are all heirloom varieties, which we ordered from Century Farm Orchard in Reidsville, NC. The owner, David Vernon, was very helpful. Both the Arkansas Black and Winesap are nearly sterile, so he recommended the Grimes Golden for pollination. We ordered one tree of the Lowry variety for Natalie’s poppaw’s—his name is Lowry. The trees are grafted on M 111 rootstock, so they’ll be about 15 feet tall when they’re full grown. We planted them with 20 feet in between trees. It will take four to five years till they produce an apple. With the extreme drought this past summer, it may take longer. Thankfully, we didn’t lose a tree, but several failed to put on much growth this first year. So what do we do for four, five, or six years? Well, we could just wait. But’s that no fun. Hmmm. I’ve got it—let’s plant strawberries. Yep, that’s what we did: we planted 1,200 strawberry plants between the rows of the apple trees this fall. Right now, the strawberry plants are under row covers, more to protect them from deer than cold weather. But so far they seem to be doing pretty good. If all goes well (and there’s a lot that could go wrong), we’ll have strawberries in four or five months—and apples in four of five years. Country ham is a staple food in our family – you can eat it on a biscuit, with grits, smothered in red-eye gravy….the options are endless. These days, most people get their country ham from the grocery store – nicely shrink wrapped in plastic. My Poppaw remembers when you just cut it directly off the ham hanging in the smoke house . Back then, most people cured their own meat at home, and his family continued to hang hams until the mid-1960’s when the weather became too unpredictable to continue doing it. Last January when we had our first pigs butchered, we decided to try curing our own ham in the smoke house my grandparents, great-grandparents, and great-great grandparents had used for nearly a century. It was a cold winter with the polar vortex spiraling across the South, and Poppaw felt like the weather would hold out long enough so that we wouldn’t loose the ham. First, we packed the ham in a layer of salt, brown sugar, and pepper. We set the ham in a homemade curing box with a slatted bottom, which allowed the moisture to drain. After 3 months, we cleaned off the salt, wrapped it in butcher paper, and hung it in an old pillow case in the smoke house. And that’s where it stayed till last week when we finally cut into it. If I am honest, I had reservations about what this ham would be like. I mean, how many people do you know that eat ham out of a pillow case? Despite all, I decided to trust the process…and I am glad that I did. It was the best ham I had ever had (and I’ve had a lot of ham). Quite frankly, my first thought was that I had truly never had country ham until that very moment in my life. Matter of fact – we should all only ever eat pillow case ham for the rest of our lives. 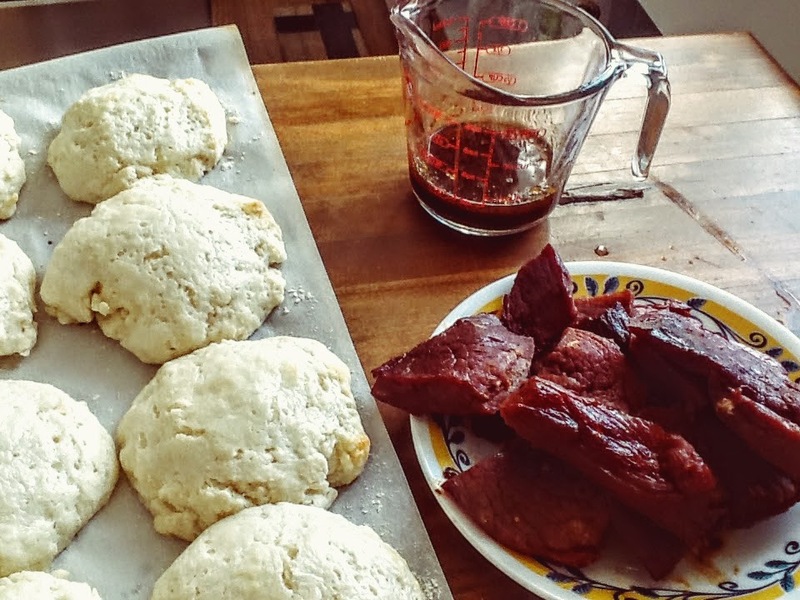 We ate the fully cured pieces straight off the ham and pan fried the rest…which then lead to making biscuits and red-eye gravy. Sometimes, on the farm we’ll try doing something the old way and it either won’t work or the new way is faster. While buying country ham from the grocery store is certainly faster….it isn’t better. 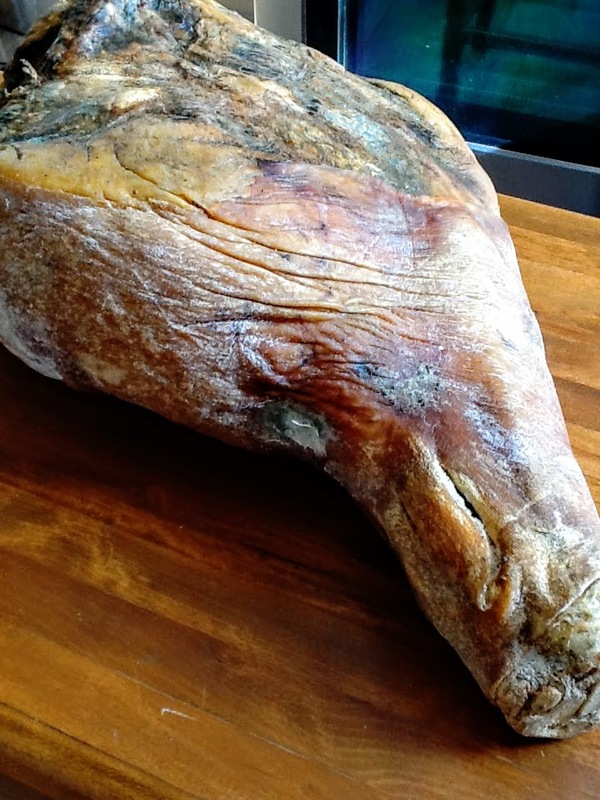 So the next time that the stars align and we have a polar vortex and a ham on hand…we’ll be whipping out the curing box and an old pillow case. After all, you can’t beat this tried and true method of curing meat!